This is that time of the year when CAT aspirants need to start filling out all individual college forms. The process of filling the main CAT form is almost done, so now the focus lies on the colleges where the scores of CAT or the other nationalized or even international ones will count. The challenge lies in filling which all. The process of being a management professional starts here. As these college forms cost money, one has to choose where all to invest. Options are plenty, but one needs to prioritize looking at one’s performances and past records. And of course, few parameters help gauge this as well as the Mock Scores. Work Experience matters a lot with 2-3 years considered ideal. Anything less hardly matters, anything more, one tends to be viewed more towards an Executive MBA kind of profile. Beyond the duration, brownie points also get added to the application thanks to the kind of work profile, industry and company. Needless to say, experience with the Big 3 of Consulting, Big 4 of Audit or any of the top international IT firms, propels one’s chances of reaching for the top of the applications pie. Similarly, Academic Records too have a bearing on the final selection. Due to pressures at the top colleges for Gender Diversity, the long-established male hegemony is coming down at the best of places, so a girl mathematically stands a better chance of selection. Similar diversity also applies to the Course of Study during Graduation. The long-held superior numbers of engineers and to an extent, commerce grads is being challenged by increasing pressure to absorb more applicants from liberal arts and social sciences. Co/Extra-Curricular Activities also matter; the former involves aspects related to academics like a science model, a business plan, quizzes or debates, while the latter is about music, dance or sports. An item that has now gained a lot of traction for selections is This shows the human side of a future manager. Nowadays business leaders are expected to be holistic individuals who look beyond just the immediate gains, so this aspect gets eminence. 95-99 %ile + good on categories A: Not much need to panic and look for various options. No point going somewhere substantially lower in brand recognition than the place of Graduation. However, one can’t be too sanguine especially if one’s experience is on the higher side. For safety, good to fill up some of the best non-IIM colleges. 95-99 %ile + good on category B but Fresher: In this case, ample chances lie ahead to improve in the future, possibly giving paper first time as an experience. One must go ahead, give one’s best shot, and look at colleges in the similar or higher bracket to where one pursued their grad. 95-99 %ile but not good at A or B: One must accept the reality and not aim only for the stars. 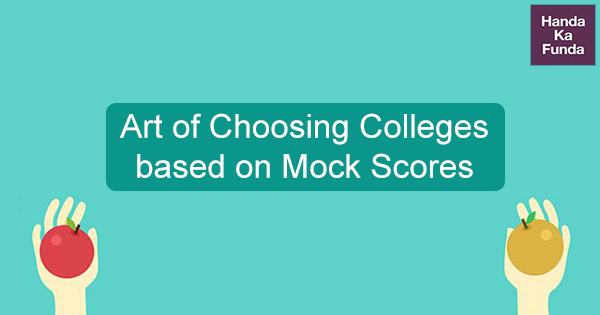 Yes, with high mock scores, definitely the very best is possible, but profile points matter, so realistically one must go for a good number of non-IIM colleges as well. One can start off by filling forms of colleges geographically based near the student’s hometown. 90-94 %ile + good on A & B: For this category, the time remaining for CAT remains a crucial period, as this is a golden chance to claw back the gap. They must not let this chance go. But, as of now, it will pay to look at other options too. 90-94 %ile + good on C & D: They stand a high possibility to go to the very top due to the prevailing factors. 80–89 %ile: Somehow, this lot has to press up the ladder. In the final CAT, even an 85 %ile may be good enough for call to really good colleges, but one has to remember these are mocks. For reasons explained above, they may be as close to the real exams as possible, but still somewhat far off from the actual thing. As of now, one has to seek options and fill up forms for a good number of colleges. For anyone right now getting less than 80 percentile, nothing to despair. But, one has to get it to the minimum 90 in the mocks to stand a realistic chance in the real paper. Of course, a number of individual college forms are not out yet, and many that are, have a generous last date. Many get extended anyway. So, no need to panic in filling those forms, but one has to keep an eye on this score to plan ahead. This report is a broad indicator. Individual positions will vary vastly. Students can look up to some of the best-known B-School Surveys, to understand which all colleges in each geographical region could be worth applying at their score levels. This article was contributed by Aritro. Aritro is an accomplished teacher and trainer with more than 8 years of experience in this field. He has worked with colleges, corporates and coaching institutes. He is also an established blogger having written extensively in the fields of education, environment, business, football, cinema, travel and food. In 2018 he was the Mentor to All India Rank 1 in the DUJAT exam. How to develop a reading habit to boost your CAT score?